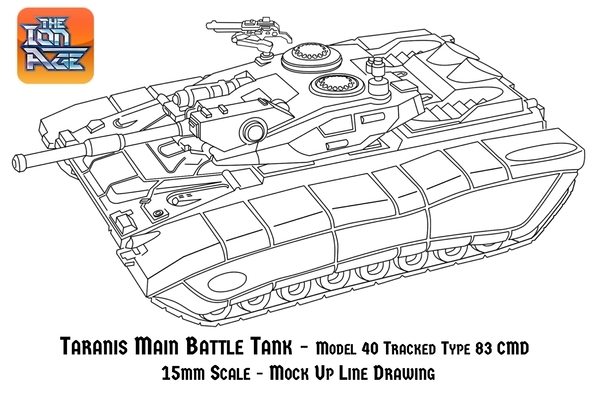 Last time we announced the existence of Project Taranis in a blog post telling everyone we were working with industry legend Bob Naismith on designs for a brilliant main battle tank in 15mm scale for The Ion Age. 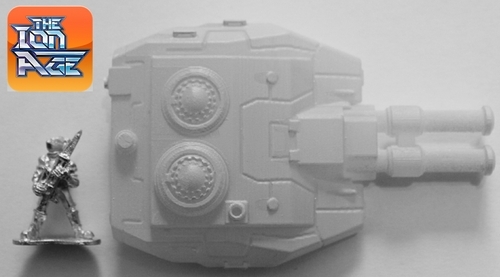 I am happy to be able to tell you that all the pieces for the Taranis project are now sculpted and printed and origination molding is well underway. 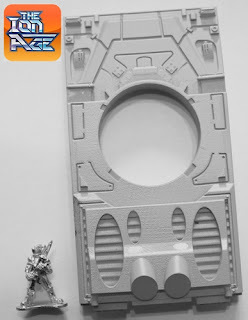 Sam Croes is now heading up the project and we now want to show you some of the 3D printed parts as well as physical sculpting work by Bob Naismith on the tank pieces and then to outline what you can expect in the coming month or so. 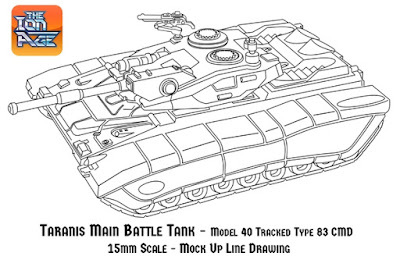 Above you can see a line drawing of the final version of the Taranis Model 40 Tracked Type 83 Command Turret vehicle. The dimensions of this variant of Taranis will be approximately 90mm long, 76mm wide and 35mm tall making it a mighty combat vehicle indeed. Armed with a Bodkin AP Mk52 130mm Cannon and a Angis Mk9 22mm Automatic Rifle its titanium alloy hull weighs in at over eighty five tons and it is crewed by four men or women of the Retained or Muster. Its extra wide tracks give the Model 40 superb mobility over almost all terrain including exotic alien landscapes. 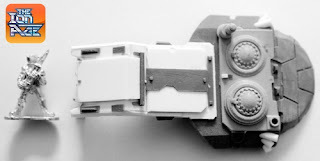 While it is not possible to show you all of the parts of Taranis Model 40 at this time we do have four images each with a 15mm scale Retained Knight (16mm tall) for scale for you to view. The first image shows the main hull piece of the tank and you can see all of the detail and the ring for the turret to be mounted upon. This piece is 90mm long and 50mm wide and will sit atop a lower hull section to which the tracked pod pieces will be side mounted. Despite its size and vigour it was always our aim that Taranis would be easy to assemble and supplied in a dozen or so parts giving a main battle tank that is impressive and very durable for use on the tabletop. The Taranis Model 40 will have a wide choice of upper pieces such as turrets. Above you can see the 3D printed piece the twin barrelled attack turret mounting two Ron 145mm Hi-Ex Launchers for urban and close in warfare. You can see its size next to the 16mm tall Retained Knight miniature. While all of the pieces for Taranis were 3D printed Bob Naismith did further fine work on some of the parts before passing them on for origination molding with us. Above is the body (minus the gun barrel) of the Type 83 Command Turret which is assigned to Taranis tank platoons and features the main gun as well as a rotary Moth cannon and a combined range and comms suit module. Additional fine work was done to the print and you can see the results on the right. We have had designed a total of seven different top pieces and turrets for the Taranis Model 40 main battle tank thus far. Most of these are variant turrets giving this tracked tank assigned roles such as a battle tank, command tank, assault tank as well as exotic turrets like the super heavy Fretan SPB9 Sequence Particle Beamer. There is also an artillery support variant with Anda 115mm Missiles and lastly above the special piece hand crafted by Bob Naismith for the Taranis Model 40 Armoured Personnel Carrier which can comfortably transport a dozen Retained Knights in full armour. We hope you have enjoyed this update. In the next update we will show you all of the pieces in resin and white metal that make up the Taranis Model 40 Tracked main battle Tank as well as the types of turrets and other items to make all of the variants of that tank. We will also outline our plan for release and what you can expect in terms of offers on the mighty Taranis Model 40. Comments and questions are most welcome to info@theionage.com and I really enjoyed talking to wargamers last time on the email about this project and what is going to give them on the battlefield of the space opera future. Great work, loving the low profile design. This is a big issue I have with most Sci Fi combat vehicle designs is their penchant for high profiles. Thanks Sebastian. Vehicles make sense for their users I suppose. As we grow we will add other vehicles and some will be higher than others. Taranis is low and mean. Its a real killer out there in the Prydian Precinct. "Taranis is low and mean" - completely agree. :) Looking forward to your future projects! Can you publish photos of the above parts on a centimetered mat? Thanks for your comment Kull. Currently no. But the next article will show the whole vehicle and all its parts with scaling. So a mat is totally possible then.